The leaves are changing color and there the temperatures are starting to drop. It is the perfect time to introduce your kids to idea of hibernation. Use the wonderful book “Bear Snores On” to get started. Then enjoy some fun hibernation activities. 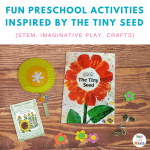 Includes crafts, imaginative play, and other ideas, so you can have fun with your preschooler. Includes a free printable. 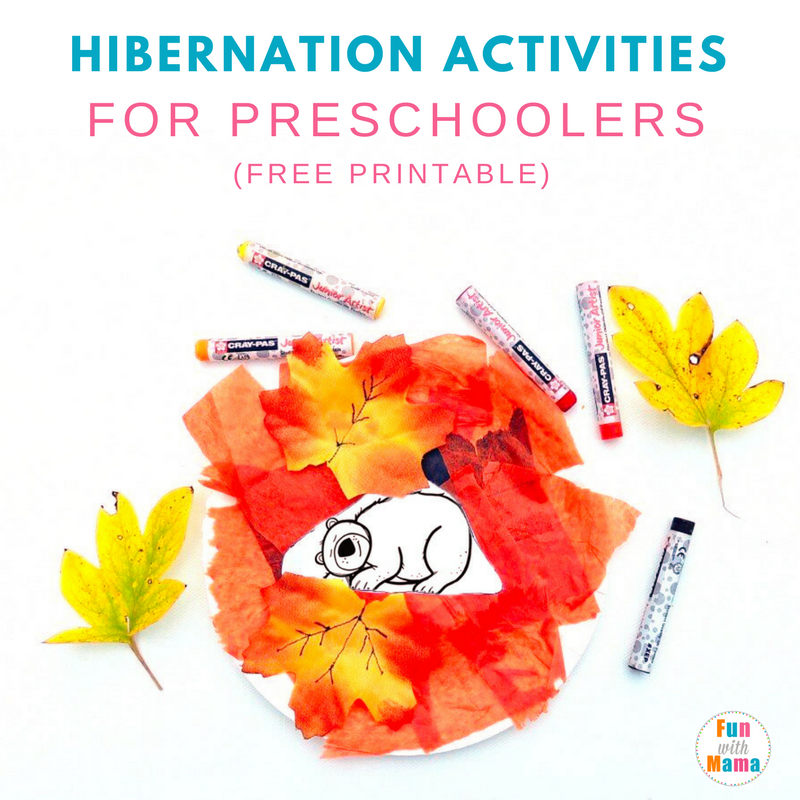 In this post you will find hibernation crafts and hibernation activities for preschoolers. Add these activities to your winter lesson plans for preschool. 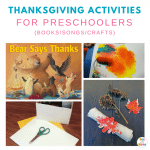 Don’t forget to check out the Bear hibernation craft at the bottom of the post too. Please note that this post may contain affiliate links. Please see my disclosure policy for more information. 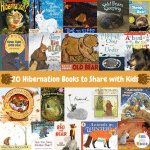 We have a whole list of 20 hibernation books for kids but today, we want to focus on one of our favorites. 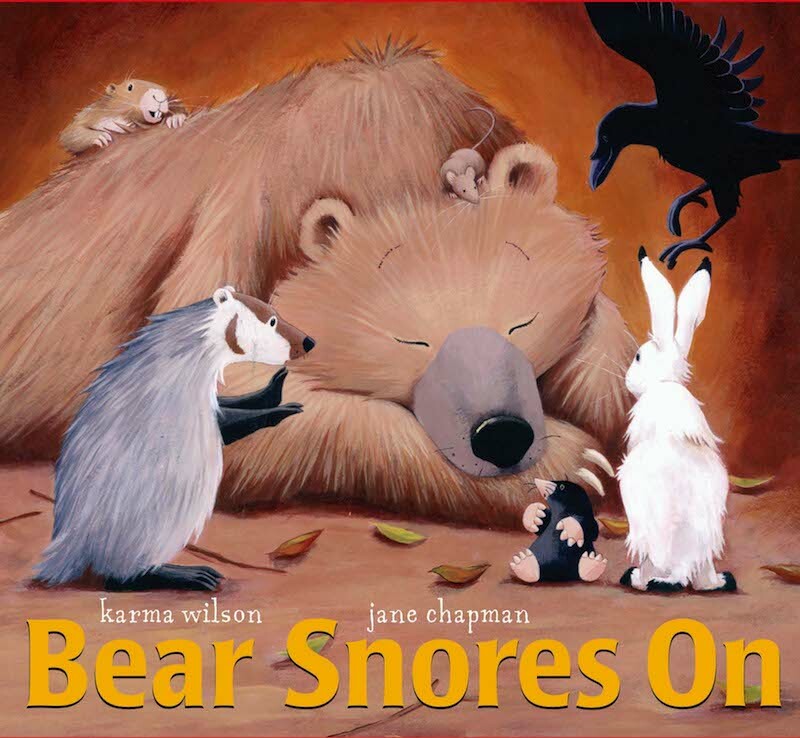 Introducing Bear Snores On by Karma Wilson. It is a cold winter’s day. Some forest animals stop by Bear’s cave to warm up. They brew tea and pop-corn and despite all the noise bear snores on. Soon there is a fully-fledged party with dancing and pots of stew. What will bear do when he wakes up? This is a wonderful story to read aloud to children. The author does a great job of building up the pace of the story. It starts very slowly with a little mouse. Then more and more animals arrive in the bear’s den and the noise gets louder and louder until bear gives a great sneeze and wakes up. The storyline and cast of characters are very appealing to young children. There are so all kinds of forest animals in the forest that join in the fun. The language is simple and easy for a young child to understand, while at the same time using inventive phrases that add so much fun to the storytelling. For example when bear wakes up he doesn’t just growl – he gnarls and snarls, roars and rumbles, jumps and stomps, growls and grumbles. After a few readings most children love to join in with the sound effects and will quickly latch onto the repetitive phrase, “but the bear snores on”. Why is the bear sleeping so much? What do you think will happen when bear wakes up? 3. Enjoy a simple craft. Have your child tear up some tissue or construction paper into small pieces (preshoolers love doing this). Glue to a paper plate (or recycled cardboard circle if you prefer). Glue a picture of sleepy bear on top. 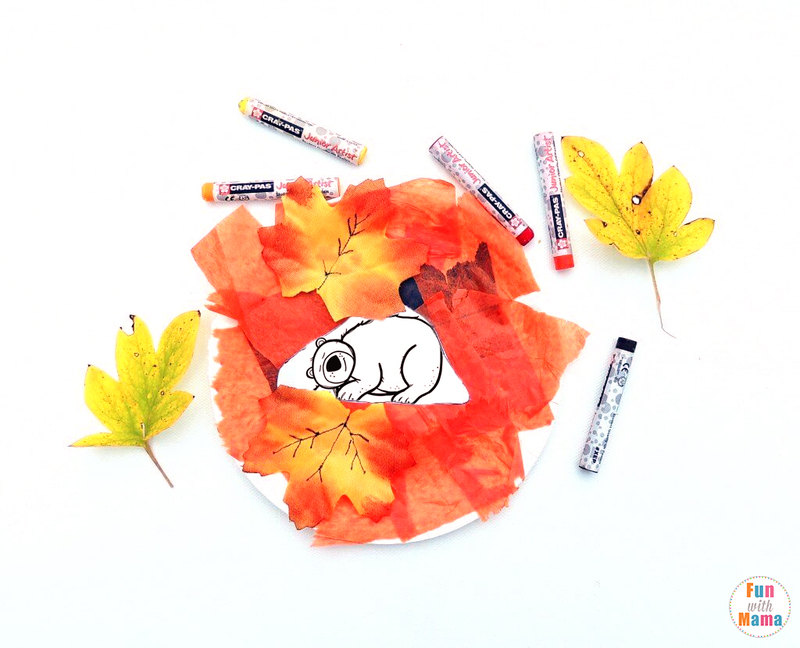 You can cut out the bear from the free printable pack (see below). Add fake leaves if desired. Pretend you are a sleepy bear getting ready to sleep. Build a simple cave by draping a blanket over a table. Invite your child to pretend to be the bear and crawl around the room slowly. Maybe they want to scratch their back on a door-frame. Then encourage them to slowly move to their cave, crawl in and curl up to sleep. For a list of animals that hibernate in the winter you can check out this post. Tear up tissue paper to and glue it to the picture to make a soft blanket for bear. Glue cotton balls on as snow. There is also 2 pictures of an empty caves. Older children draw their own sleeping bear, or perhaps the forest animal having a party, on the black and white one. The colored one could be used as a playdoh mat. Have your child make a bear out of playdoh to add to the picture. 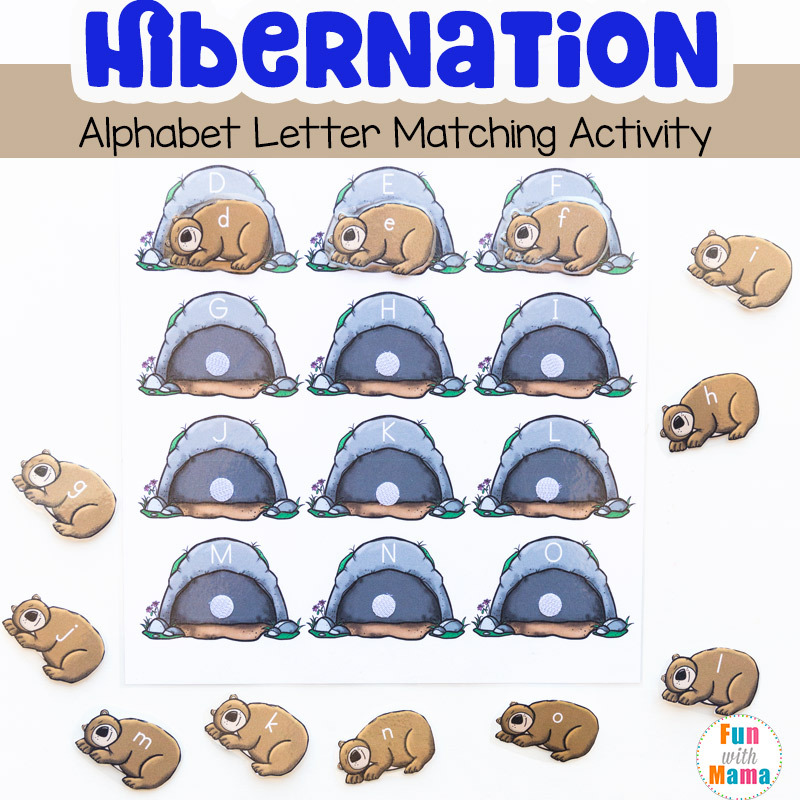 I have included a hibernation craft for preschoolers and toddlers below. 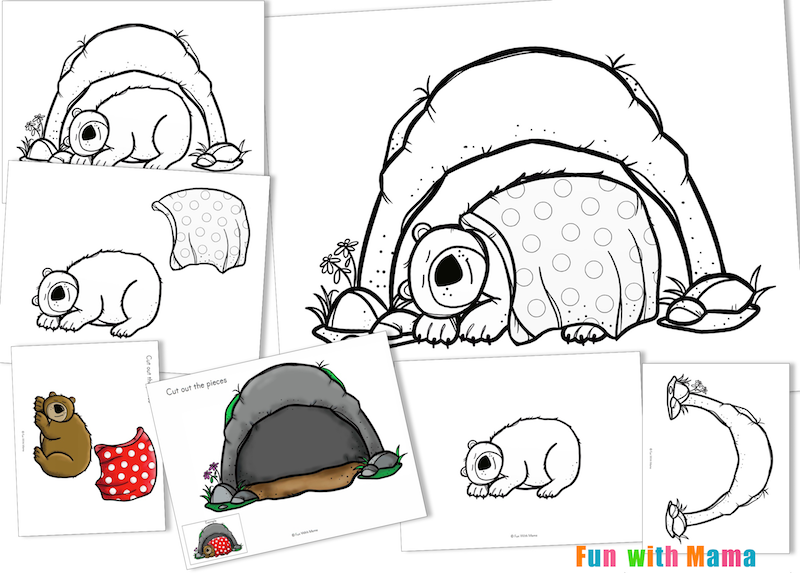 Do you have any favorite hibernation activities for preschoolers? Share them in the comments below. 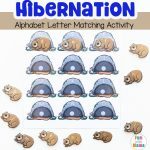 You have thought of just about everything to keep children excited about learning about hibernation! It is awesome for kids to enjoy the activities in the winter! Thank you for sharing such wonderful and varied activities! My students will really enjoy this unit thanks to your input! Bear Snores On is one of my favorite books.